As suspected, Apple spent the majority of this year’s keynote talking about OS X 10.10, otherwise known as Yosemite, and it’s a doozy. 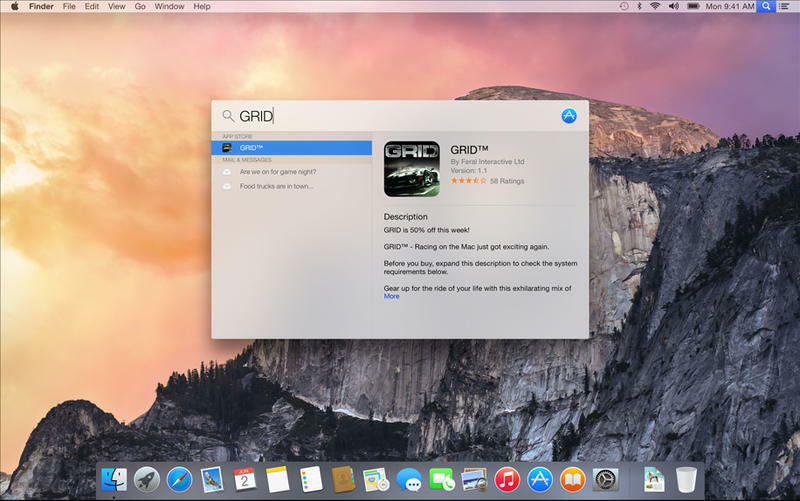 Whereas last year’s Mavericks update focused mainly on improving speed and efficiency, this year’s update is aligning Apple’s famous desktop OS to look and perform more like it does on mobile. That means it has been redesigned with a focus on translucency, and things like Notification Center and Safari more closely mirror what you’d see on iOS. “Every bit as powerful as it looks,” Apple said. 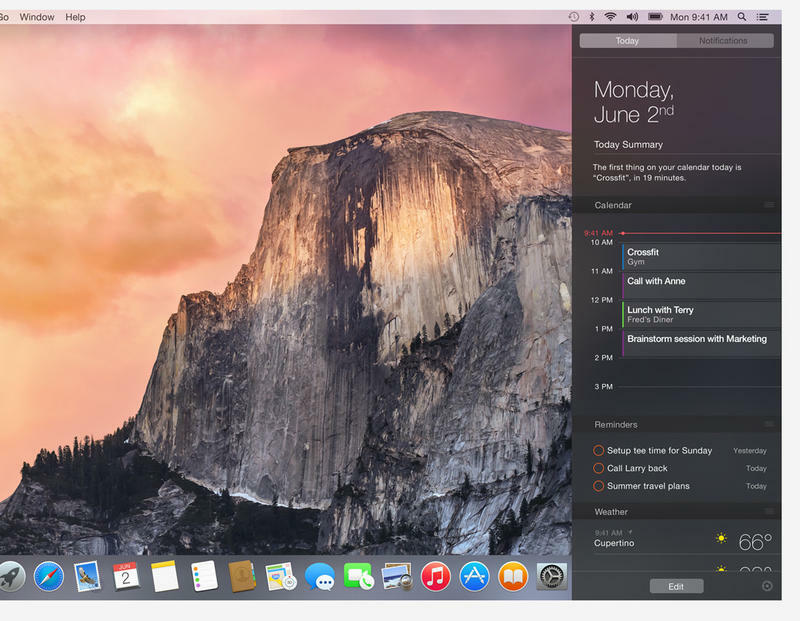 During its presentation, Apple said it focused on making Yosemite feel fresh, while still retaining that familiarity brought over from a desktop environment. But this time Apple is emphasizing how your Mac talks to your iOS devices—and how it looks, too. Call it the Windows approach, or call it whatever. The main thing is that Apple is using a slick new redesign to create a synthesis between its platforms, and introducing some big features along with it. Like iOS, the Notification Center in Yosemite now comes with a Today View, providing users with more information at a glance. In addition to a simple summary for today and tomorrow, Apple has introduced “widgets” to the Today pane. Imagine the same iOS experience basically being imported to your desktop, making it easier to see what’s on your calendar, what reminders you have set, and even stuff like weather, too. These things are all interactive, Apple said, and you can easily customize it to give you the exact information you need. Apple’s new Spotlight is essentially Alfred, but built right in. Instead of residing in the upper right-hand corner of your screen, Spotlight will instead appear in the center, showing you a big bar where you can pretty much search for anything on and off your computer. Just type in a few letters for a query, and the relevant information will begin to populate, whether it’s from your built-in contacts app, or on Wikipedia. What’s great is that Spotlight taps into third-party services such as News, Wikipedia, Bing and more. Say you want to bring up movie times: open up Spotlight, type in a movie name, and it’ll appear right there for you; you’ll also see Rotten Tomato information to peruse reviews, or just do an online search to learn more about your search. Maps results show up in Spotlight, too, along with information from Yelp, essentially making Spotlight the most powerful application on your computer. Additionally, when you search for a program, say Pages, all your recent documents will show up under the application to the right, allowing you to see a beautiful view of your projects. You can also do things such as conversions, search for apps, and even search through the iTunes store for music and videos. 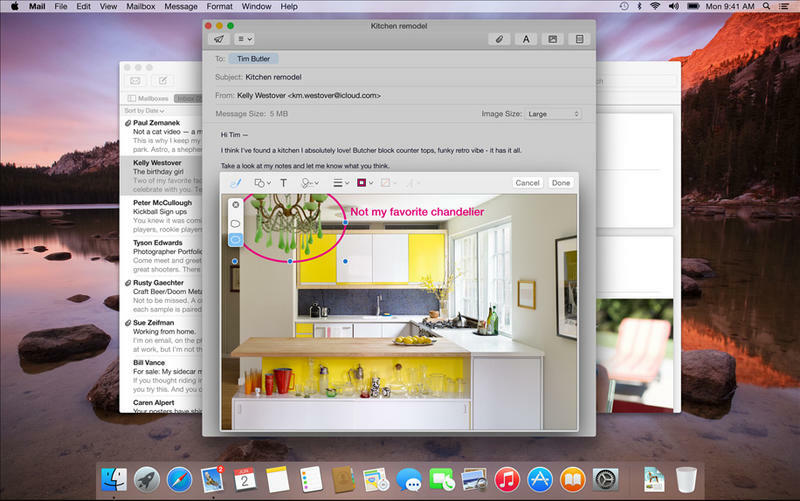 Apple’s built-in Mail app doesn’t have the best reputation in the industry, but it still comes with some great features, and it’s getting even better in Yosemite. In addition to being able to easily annotate images and PDFs, Mail now allows you to send larger attachments by sending the recipient a secure link they can download the file from. The UI has also been more streamlined, with an emphasis on simplicity and usability. 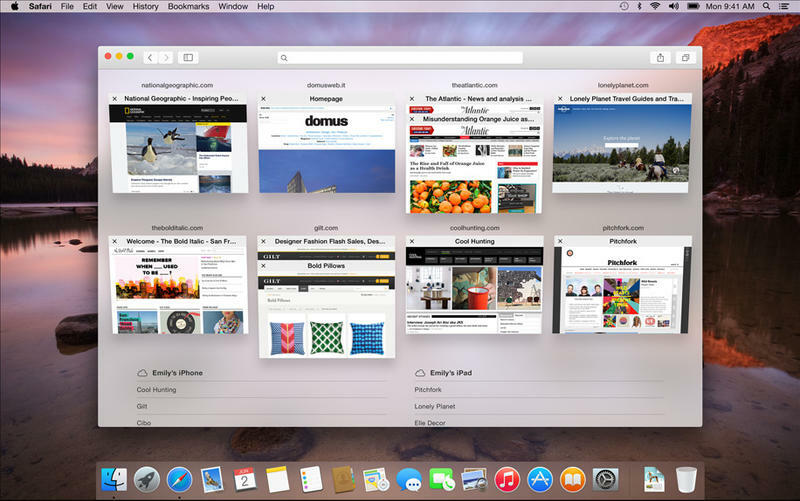 Really, there are more than fives features Apple introduced to Yosemite, and we could go on all day. The redesign is also introducing a cleaner dock, better controls, and an overall environment that allows you to get work done—and then carry that work over to your iPhone or iPad. 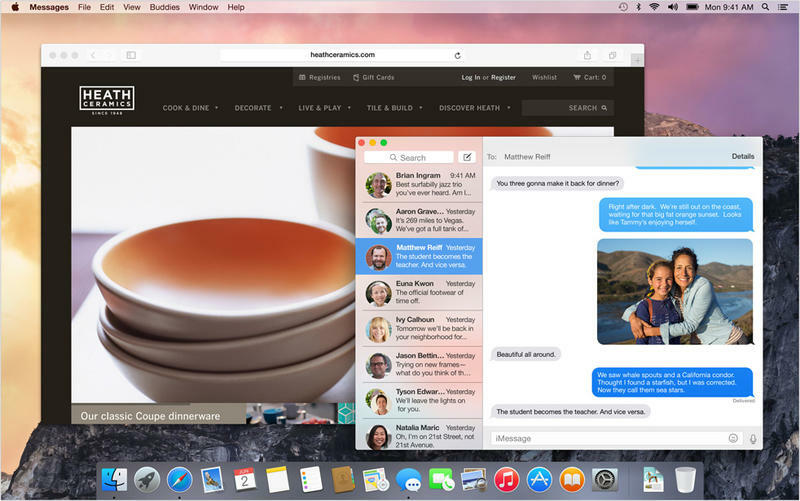 Yosemite isn’t just trying to more closely mirror how iOS looks, but how it interacts, too, making it super simple for you to sync your work across multiple platforms. Spotlight is perhaps Yosemite’s strongest feature, putting your entire life and the Internet at your fingertips, cutting out having to do the legwork for yourself. Built-in apps are stronger, you can pick up calls right from your Mac, and you can even send and receive SMS messages from friends and family, regardless of what phone they have. 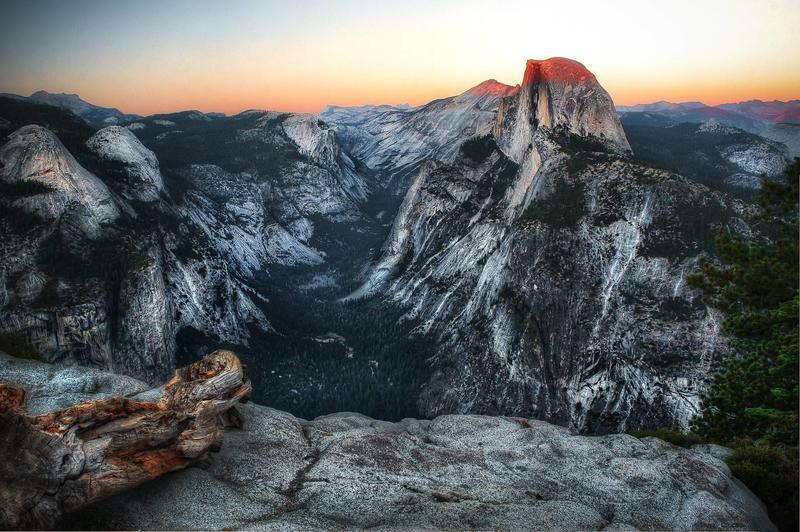 Yosemite is a strong name, and one of the most recognizable landmarks in the world, let alone California. Apple said with Mavericks, customers downloaded 40 million copies following its release last year, making it the most adopted PC OS in history; in comparison, Windows 8 has only received 14-percent adoption since its release. That’s likely to continue given what we’ve seen, and Yosemite will once again be free when it his later this fall. Apple clearly has lofty ambitions for Yosemite, and is really trying to marry the desktop and mobile experiences into one. Along the way, we’re getting some insight as to how we work—whether it’s searching for terms through Spotlight, or being more product across multiple devices with something like Handoff. As Apple said, the company is really trying to elevate the experience of using a Mac with Yosemite, and it appears to have done just that. 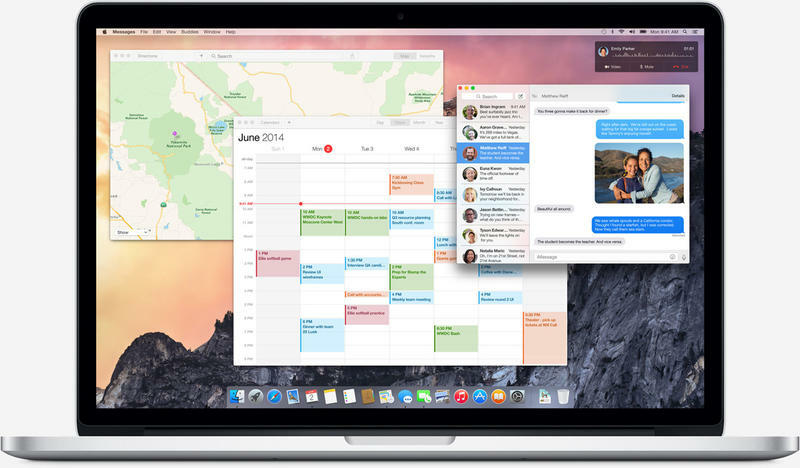 If you can’t wait to try out Yosemite when it becomes available for free this fall, you can sign up to be part of the OS X Beta Program, giving everyday users the chance to get a sneak peak before it launches.